Most of us desire strong and healthy bodies but not everyone leaps out of bed at the sound of the morning alarm with the blood pumping to hit the gym. For many, it can be a necessary evil – particularly if it’s just one more thing we have to squeeze into our time-poor schedules. The gang at Core9 are well aware that after the initial burst of members’ enthusiasm for getting all fit and fabulous, that very same motivation can often take a nosedive – and then the excuses to avoid workouts start to pile up thick and fast. As the name suggests, Core9 focuses on rotational core workouts by focusing on the three seriously kickass components of kickboxing, gymnastics and military training. Their mission was to develop a motivational system to support members in achieving their fitness goals via short but intense workout sessions of 31 minutes each – maximum benefit in the shortest time possible. This in mind, they handpicked Thought Studio to engineer and install easy-to-use digital screen technology to play specifically balanced Core9 training videos designed to target different physiological zones each day for rapid and safe results. While gym members are still constantly monitored by qualified staff, the screens play training videos – changed up on a daily basis to avoid the boredom factor – for inspirational self-powered workouts. With three screens playing a different program every day for each of the exercise components, this meant that the pre-built media players were required to play an immense amount of high quality content. The training videos (80-100mb each), uploaded to the Core9 server, require 2 Gigabytes of bandwith per week. Version 3.5 of the Thought Studio Digital Signage system was initially rolled out for trial, quickly revealing a requirement for a timetabling solution whereby workouts designed by staff a month in advance were uploaded via a daily schedule to ensure exercise balance and appropriate intensity for their members. Staff manually stack three bespoke video files, each corresponding to the relevant kickboxing, gymnastics and military training workout screens for daily rotation. A further necessity for automation to reduce scheduling time saw our developer creating a modified codebased solution, due for instalment shortly. Via a train-the-trainer system, Thought Studio run through the features with key Core9 staff – how to upload/schedule content and detail the best file formats and resolutions – then this operational knowledge is then passed on to new staff. All in 15 minutes per session. Dealing with Jason and his team has been invigorating. They’re very energetic businessmen and Jason’s military background means he’s very focused on getting things working from the start. It’s been a great experience to get involved with Core 9 from their humble beginnings at Manly and watch them grow into a national force to be reckoned with in the fitness industry. 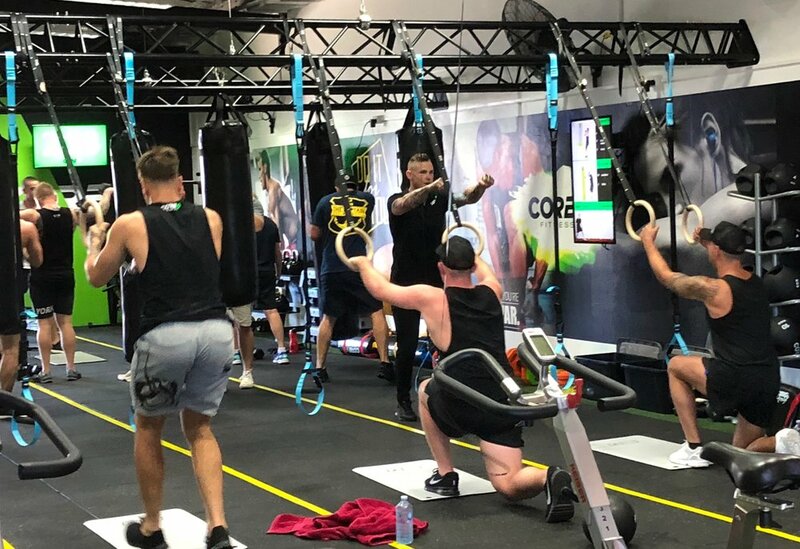 Since its inaugural opening in July 2017 at the Manly location, Core9 has now expanded to several more locations in NSW, Queensland and Western Australia with the screens and 3 TS media players included as part of the franchise package along with the gym equipment. With a range of agile feature-rich products at its fingertips, the bright sparks at Thought Studio are committed to working in close partnership with clients to design unique and responsive IT solutions – and far into the future with product improvements and upgrades. FUN FACTS: 3,280 calories burned by our engineers walking to the kitchen to make bracing coffees during the development of the additional features.